Fast ELISA kit now available: Boster is proud to announce the newest Picokine Fast ELISA kits. Now you can perform what used to be 4+ hour ELISA assay in under 1.5 hours. 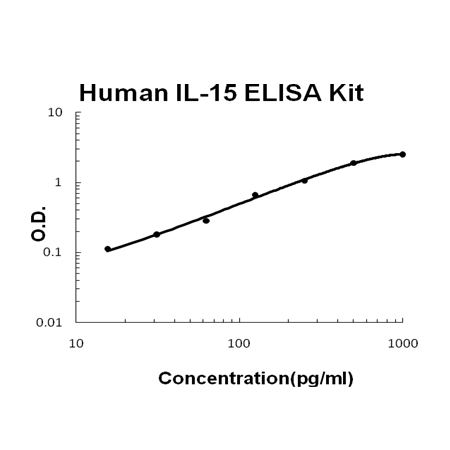 Available for Human IL-15 PicoKine™ Fast ELISA Kit and many others. Sandwich High Sensitivity ELISA kit for Quantitative Detection of Human IL-15. 96wells/kit, with removable strips. Most abundant in placenta and skeletal muscle. It is also detected in the heart, lung, liver and kidney. IL15- S21AA is preferentially expressed in tissues such as testis and thymus. Cytokine that stimulates the proliferation of T- lymphocytes. Stimulation by IL-15 requires interaction of IL-15 with components of IL-2R, including IL-2R beta and probably IL-2R gamma but not IL-2R alpha. Interleukin(IL)-15 is a cytokine with the ability to stimulate the proliferation activity of Th1 and/or Th2 lymphocytes. IL-15 is a novel cytokine whose effects on T-cell activation and proliferation are similar to those of interleukin-2(IL-2), presumably because IL-15 utilizes the beta and gamma chains of the IL-2 receptor. IL-15 can play a role in the initiation and outcome of acute and chronic rejection. Anti-IL-15 therapy in combination with classic immunosuppression therapy might thus be beneficial in the prevention of acute, and especially chronic, allograft rejection. The human IL15 gene is mapped to human chromosome 4q31 by fluorescence in situ hybridization.1 The standard product used in this kit is recombinant human IL-15, consisting of 114 amino acids with the molecular mass of 12.9KDa.